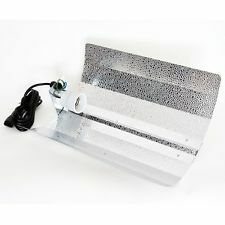 Our Euro Grow Light Reflector is quite simply a great budget reflector at a great price. The Euro Reflector is designed for use with any horizontally mounted HPS or MH lamp up to and including 600W. It is not suitable for use with 1000W HID lamps. Simply hang the HPS grow light reflector over the centre of the grow-space at an appropriate height using easy rolls or jack chain. Holding your lamp with a clean cloth insert it into the E40 lamp-holder in the Euro Reflector and screw it in very firmly. Plug the lead into an appropriate ballast for HPS/MH type bulbs or an IEC (kettle type) mains lead for fluorescent type bulbs and switch on. Warning: When HID lamps are switched on they run extremely hot. As with all high pressure sodium and metal halide bulbs it is necessary to avoid touching the lamp with anything such as fingers or plants as this may cause severe burns or fires. In particular avoid sprays or liquids coming into contact with the lamp as this may cause premature failure or even an explosion.